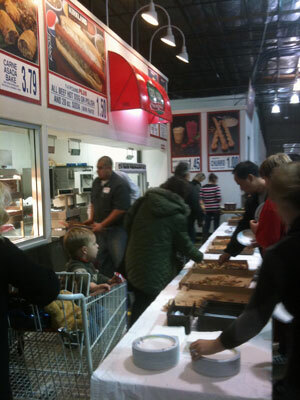 Last month I attended an event titled Costco family night. In short, the employees and their family members get Costco all to themselves after hours. We got to shop the store quietly, Santa was there, there were raffle prizes, and best of all, there was free food court food. All the pizza, hot dogs, churros and more I could eat! This was the first time I was able to make the event and a nice employee benefit that I look forward to going to in the future. The picture is one I took of some of the food they had there.